Bone Dragons are large, hydra-like dragon skeletons that Yoshis encounter underground in the game Yoshi's Story. Bone Dragons usually block Yoshi's way, and to get past them, Yoshi has to either throw Yoshi Eggs at its head, or Ground Pound it, with either method taking two hits to defeat the Bone Dragon. In a couple of cases, Yoshi encounters a three-headed Bone Dragon, complete with a body. Each of the heads take two hits and Yoshi receives three melons when it is defeated. Touching the body will not hurt Yoshi. 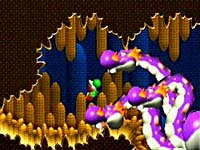 An underground cavern on Yoshi's Island, called the Bone Dragon Pit, is also explored in Yoshi's Story; as its name would imply, the Bone Dragon Pit is infested with Bone Dragons. However, Bone Dragons are very uncommon enemies since they only appear in that specific level. Super Smash Bros. Brawl has a Sticker of a Bone Dragon that raises the strength of attacks that involve biting by thirteen. It can only be used by Yoshi, Wario, Pokémon Trainer, and Wolf. In an early version of Yoshi's Story, Bone Dragons weren't skeletal at all; they were purple and orange colored, multi-headed, and were less sinister looking. A Bone Dragon-like creature makes a cameo in Snowflake Lake in Mario Party 6 and Pyramid Park in Mario Party 7. Both of these, however, have horns and more rectangular faces. This page was last edited on April 8, 2019, at 08:41.